Capturing action in a sculpture is a talent that wins the admiration of the world’s wealthiest. This specialized craft seizes the attention of normally busy people. A statue or piece of sculpture that has been the product of a master artist draws out the wonder in people who appreciate such talent. My early days of art appreciation was more like an elimination than a discovery. Elementary school teachers introduced me and my classmates to sculpting. They put a lump of clay in front of and told us to make it into something. Several of us sat there, staring at our clay. A rare student was busy shaping, gauging and pressing the clay to match a picture in their mind. I remember watching a student going after the clay with enthusiasm. Finally, I saw in my a dinosaur. It was a triceratops. In my mind this magnificent reptile was properly proportioned, vivid in detail and ferocious in stature. When I finished with my sculpture, there was no sense of proportion, details did not exist and “odd” was my only reaction to my product with no ferocity whatsoever. My teacher walked by and commented, “Nice work, Bruce, what is it?” She complemented me but could not guess what I had created. That’s when I looked down at my creation and saw that two of the three horns had fallen off, the tail was more like a hotdog and the eyes were crooked. While I imagined my ancient creature stomping through the jungle, it looked more like a mythical alien that had tripped and fallen on the art table. I was given the option of starting over. Of course I took that offer. However, God gave the talent of artwork to a very few who make the rest of us appreciate their skills. Frederick Remington is one of those outstanding sculptors whose art lives on for generations. It is not just his craftsmanship but the genre of his work. Remington captured the fast-moving exciting scenes from the Old West. 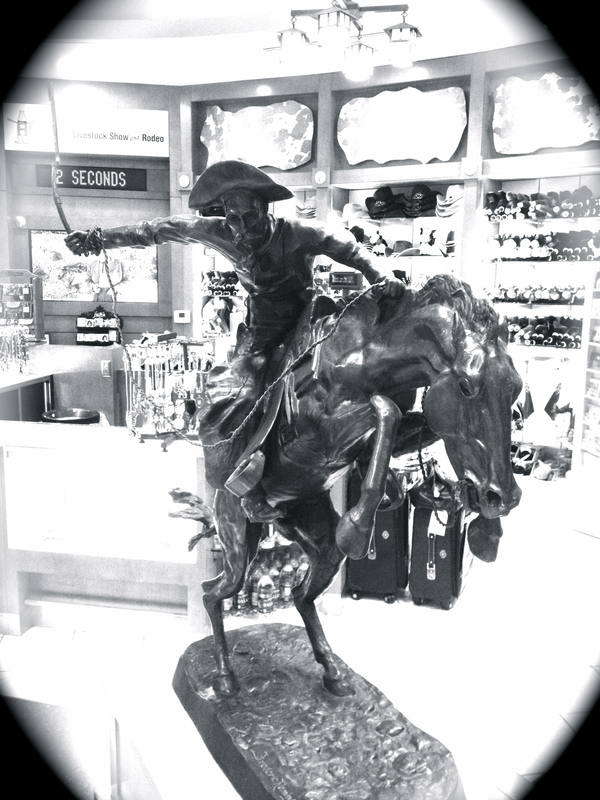 The world of cowboys and Indians locked in adventures that tamed the wild plains and mountains is the slice of life often preserved in bronze statues. One of those classic pieces was in the center of a store in the Houston Hobby airport. It captured my attention. Nothing else in the store interested me. In fact I probably would not have stopped except for this Remington piece. All of us can leave something spectacular for the next generation. God made us great that way. Find out what He has created you to do. Some people make a living by studying Jesus. 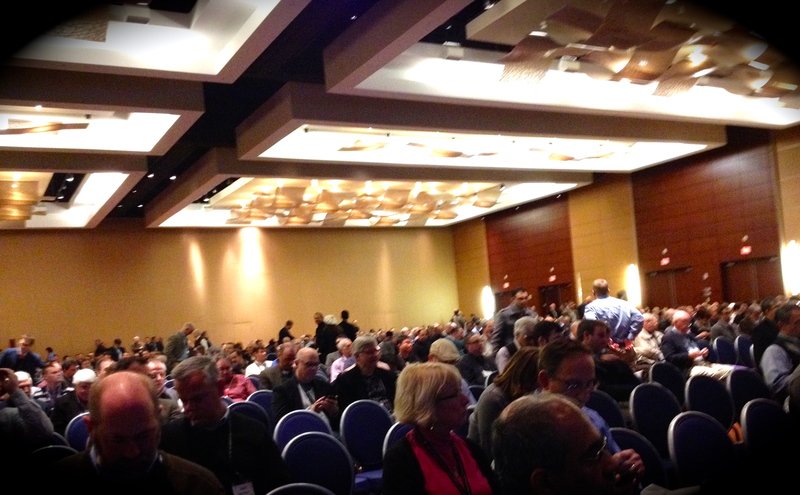 Over 2,000 of them gathered in the Hilton of Baltimore this past week. I was privileged to be among them. For days we gather in multiple locations to hear our colleagues read papers of their latest research. It is stimulating, challenging, provocative and encouraging. We hear about the latest in debates over theological issues. The brain power that occurs at this convention is mind-blowing. Publishers come and set up their booths. Sure, they want us to buy their latest books but just as importantly they are seeking acquisitions. Plenary sessions gather the thousands in a huge hall. One presenter captures our attention. While we are all from different parts of the world, we share in common a huge passion for the Bible. Some look at the Bible as a mystery or the “Good Book” or a lucky charm to keep in the house. None of those views are held by my fellows at the Evangelical Theological Society. 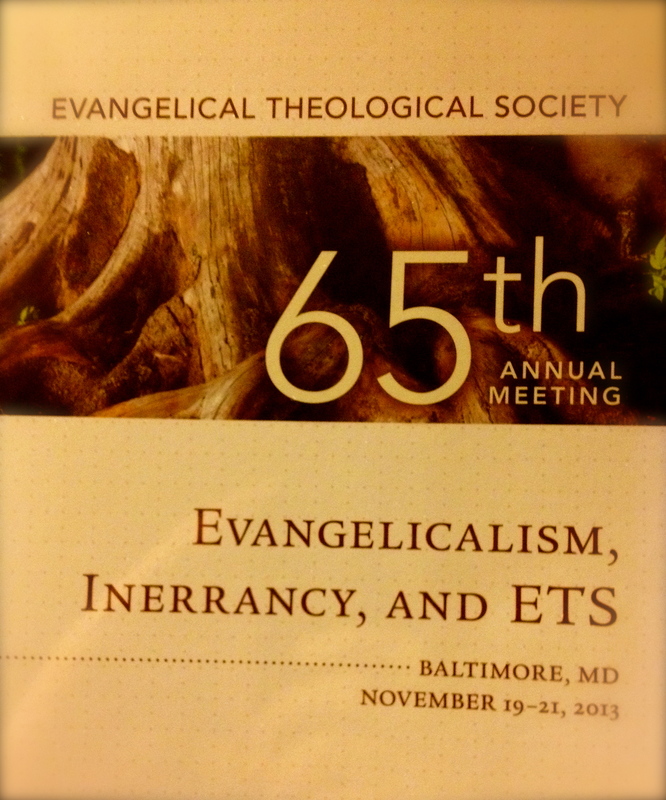 These conferees are all serious scholars and academics who treasure the Scriptures. With learned skills and endless peer reviews on millions of words both written and spoken, these colleagues have served as the guardians of truth. They are driven by conviction and commitment. Among them they share a devotion to their craft and do not allow room for sloppy research. Besides the intellectual stimulation there is amazing fellowship here. Several times I heard my named called out. I stopped walking and turned to see an old friend from many years in the past. Sporting huge smiles we clasp hands, hug tightly and laugh uncontrollably. Quickly we exchange a thumbnail sketch describing years of God’s faithfulness in our lives. We exchange our latest contact information, wave farewell and head to our next chosen meeting. For breakfast I awoke early. 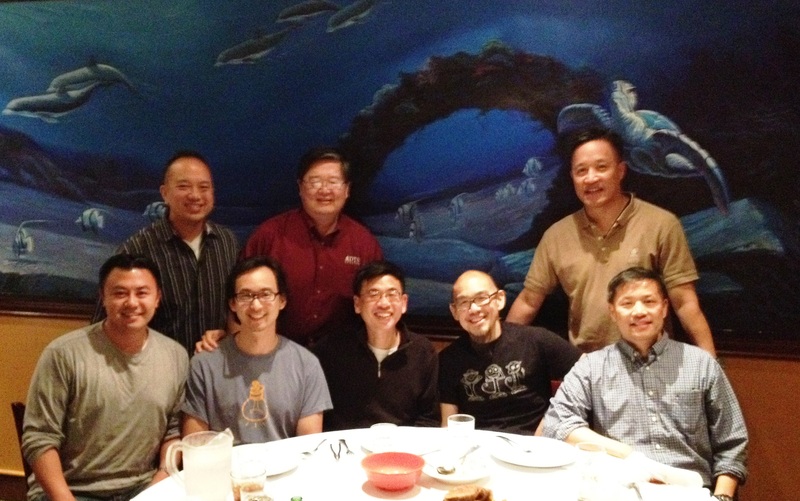 Once I had washed up, planned my day and headed out, breakfast with our seminary alumni association was waiting. Graduates from DTS gathered. The room was packed. Breakfast was good. Reunion celebration was unparalleled. We heard about God’s favor on our ala mater. It was marvelous to see the numbers, hear the reports and see pictures of the past and the future. Excitement has a way of stirring the spirit and show our connection with this massive historical privilege. I have come home smarter just by hanging out with very smart Jesus followers. They sharpened me. Iron does that in the honing process with other iron. My hand was aching while I took feverish notes. I did not want to miss a thing. This was more than a formality to me. I really wanted to learn. Our instructor threw in a humorous anecdote. The one place that you really don’t want to ride your motorcycle is to Costco. Everyone laughed. It made so much sense to all of us newbies to motorcycle riding. Who comes out of the big box store and does not need a pick-up truck? Two saddle bags that have a combined capacity of a few gallons does not fit the average trip to this store known for quantity. That little quip many years ago came to mind. I stopped at Costco with my pick-up truck. Of course I was checking my wallet to make sure that I had enough money for the adventure. 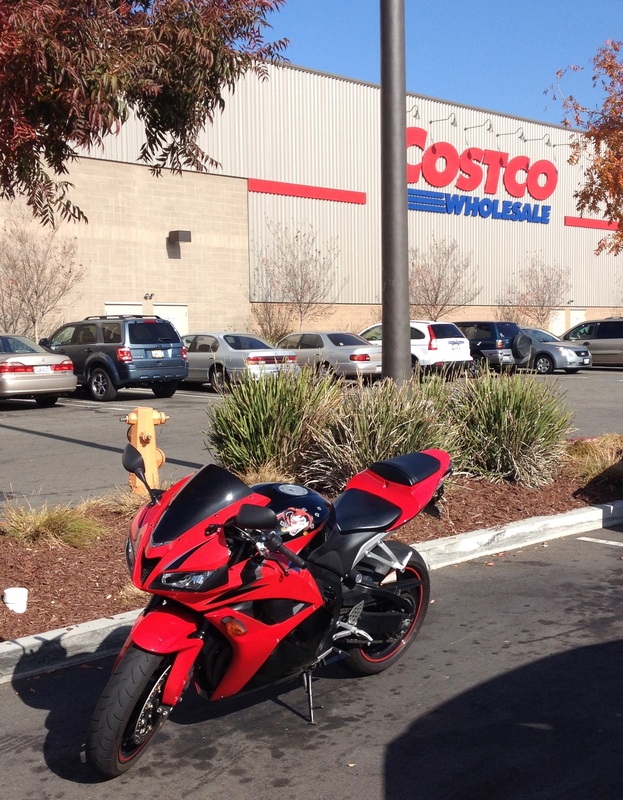 Then, I laughed when I saw the motorcycle parked in the Costco lot. The national motorcycle standard for safety is embodied in the certified safety course taught in most states around the country. When I enrolled in the course, I was living in Oregon. The waiting list stretched into at least three months. We were welcomed to come to an earlier class and wait to fill in a “stand-by” slot if someone who did not show up left an open slot. I tried that one time but their were five others ahead of me. There were four “no-shows” for that class. This was a popular offering. People wanted to earn their safety endorsement. The statistics were clear. 90% of those who were in a motorcycle accident did NOT take this course. Insurance companies supported this avenue of training. They offered a discount policy for anyone who successfully passed the course. The incentive is very attractive. Paying less for the privilege or riding has a strong appeal. This course taught me the right way to mentally enter the wonderful world of riding. It also taught me the basic skills to handle my machine on the road. Constantly my mind was focused on the instructors and the introduction to new ways of thinking and abilities. In the classroom we went over the laws and the advice to keep riding safe. We watched videos and heard from lifelong riders. A helpful workbook kept us on track. Life is a blessing when we can laugh at the small things in life. God has not forgotten us. Even a little laughter is a gift from above. Once we were total strangers. Our paths had never crossed. Each of us had lives that were being lived completely without each other. Then, something changed. 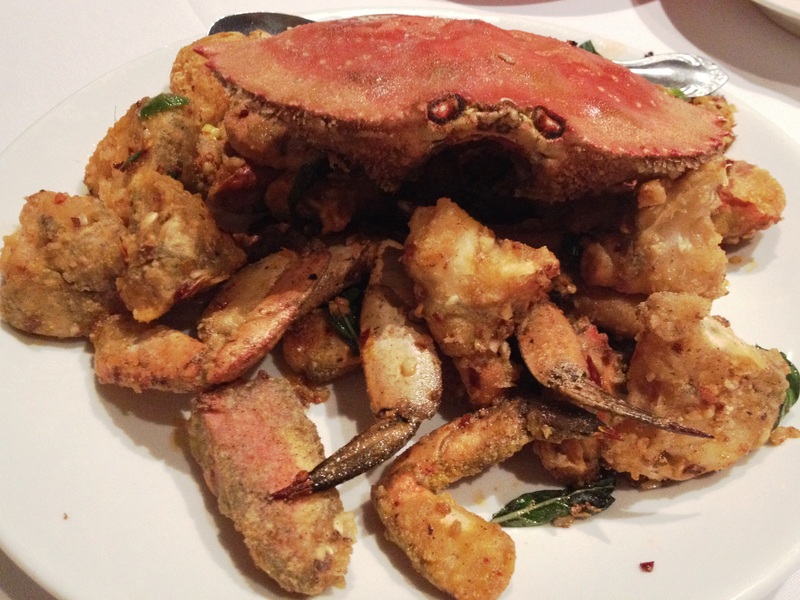 It was not fate or the realignment of the stars nor was it even the meal that we had eaten that night. Instead, it was the blessing of God that rearranged our lives to connect at church. We were all ardent followers of the Lord Jesus Christ. As men we each had a wonderful wife who stood faithfully by our side. Then, independently of one another, we sought our Savior for not only our faith but also for our devotion in life. I was their pastor. They were men in the church who showed great initiative, maturity and passion for the truth of the Scriptures. I watched as they lived our faithfulness, availability and teach-ability. Over time I heard them teach, carry on mature conversations, and express their convictions with wisdom and insight. I was convinced that these men could do more. We talked about pushed a new envelope in spiritual productivity. I wanted to teach these men how to preach. As I explained the plan, they each responded as I expected. They wanted to think it over and prayerfully consider the opportunity. Of course as wise men they would talk it over with their wives. One by one they agreed. They were looking forward to our times together. It was exciting to teach good men the skills to pass on spiritual and eternal truth to others. Of course the proof is in the pudding. Each of these men were assigned dates to preach in church. I was right there with them when they did. The receptivity was powerful. People could see that there was a reason that they respected these men. The words that they spoke were organized, powerful and sincere. What human ears heard was something spiritual. Our souls knitted together as we studied God’s Word. It was not adding to our human prowess. Rather our time was deepening our devotion to our Savior and to each other. Time took us in separate directions. Yet, a reunion was born in heaven. We reunited and a special meal was the excuse. Like the return of the Magnificent 7, we gathered without hesitation, without a loss of words and no shortage of good blessings to report. Time slipped by and the evening grew late. 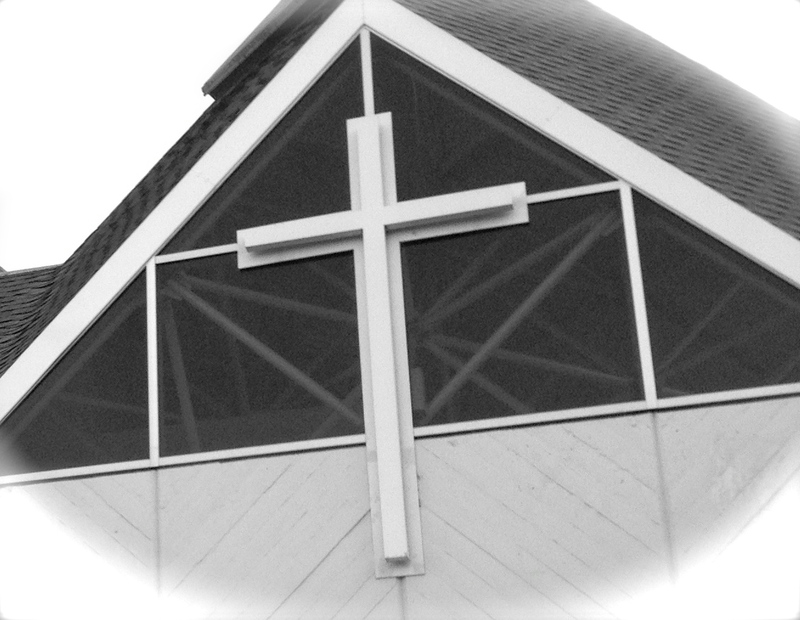 Soon, too soon we said our farewells as devoted friends and committed followers of our Savior. I love these guys! I am in the transition generation. Modern technology has kept me scratching my head. Once I get my arms around one new twist in the world of cyberspace, five others pop up. Vocabulary, short-cuts, speed and wonder are all wrapped together and leave me bewildered. Just when I am feeling sort of confident with one mechanism, I find that I have to learn a new system, a variation or a completely different practice. Just the world of computers is amazing. I remember taking a laptop to the library to do my research. It had an 8088 chip inside. This processing unit made me feel modern. The portable computer weighed 28 pounds. Now, my smart phone is brighter than that unit. Nevertheless, technology has brought us a special blessing. Our first grandson is 2,000 miles away. 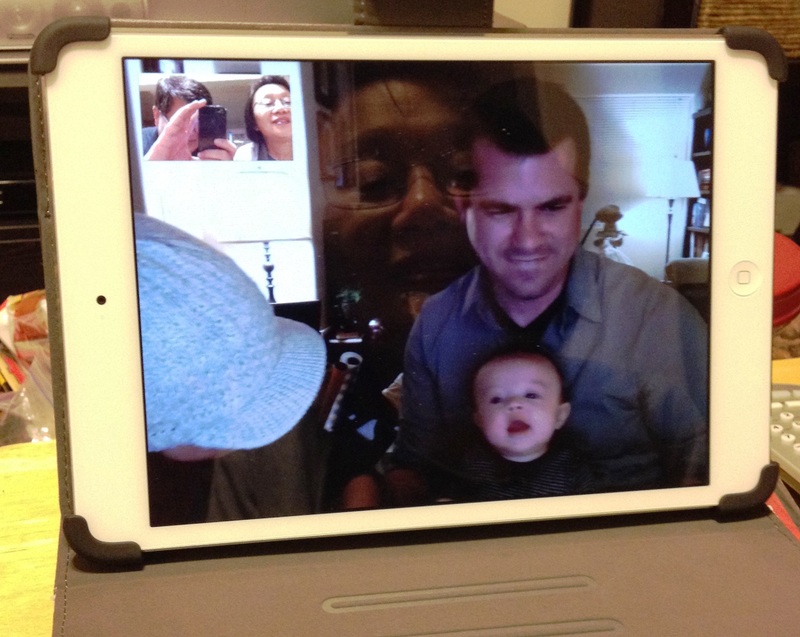 We had our first Skype visit. It was fun. In real-time and with real sound and real video we watched each other, talked to each other, laughed with each other and just hung out over two-way communication together. It took me a while to warm up to the experience. I am used to Skype but I normal enter into that scheme with a prepared agenda, a designated chair and team dynamics. At the office we use this technology on a weekly basis. We are very productive with this media option. Now, however, it was very different. We had no agenda. No one was running the interaction. It was just spontaneous conversation. That was odd. It took some time to get used to it. At the office I am used to spotting the end of the dialogue. When it happens everyone is ready to hang up. This was so different. It was time to let moments of quietness fill up with our grandson’s noises. Noises came from both ends. They all made us laugh. I do not know how much the little guy can comprehend on the computer screen. But, it really did feel like he was watching us. His eyes and sounds made us feel close to this precious little life. We still measure his age by months. He has not been long with us yet he has won over every heart in our family. We have welcomed him with open arms. Here on Skype he is opening his arms and laughing with us. We burst out laughing and the cacophony of our raucous sounds startles him. So we smile on and chuckle on and love on through the wonderful world of technology. Our workdays are usually filled with fun, laughter, cheer and encouragement. We all have our tasks and almost all are facing greater to-do lists than the hours in a day allow. That kind of busyness encourages us to help one another, cheer each other on and to work hard at our own responsibilities. We laugh about our unofficial “official” motto: “Any reason for a party!” Someone may bring in snacks to share, announce a special day or just call for a month of birthday recognitions. We break out the napkins, plastic wear and paper cups. Our parties are not long. Everyone seems to know that this is normal practice so that we can look forward to many more “breaks” in our busy days to “party” for one reason or another. This reason for our overwhelming cheer overflowed in further recently. One of our office staff members brought in his family pet. I do not even remember its name. But, if it was called “Cutie” it would have been very fitting. His family pet was a hedgehog! Yes, this bundle of cheer just begs to be petted. Some of God’s creatures just lend themselves to be touched, felt for amazing softness or just the connection of life to life. Naturally, I grabbed my cellphone camera and took a snapshot. Most of the photos are blurry. The little guy was constantly in motion. I sent the photo to my family. Everyone raved about this life form. 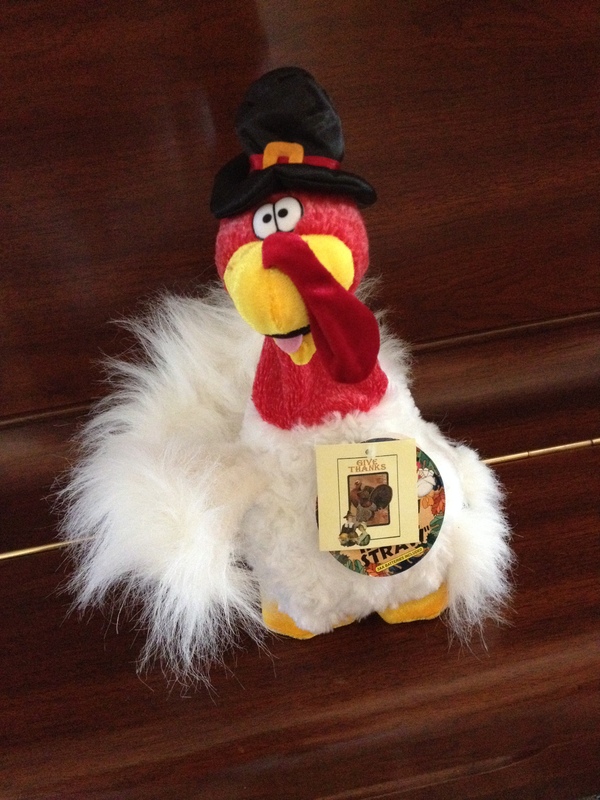 One comment was to make it the new Seminary Mascot. I suppose that we could dub him the “Hedge of Protection”. Another exuberantly exclaim, “Oh, I just want to touch and pet him.” When God created this creature, He gave it a little panache. Some animal repel. This one attracts. When it is calm, his quills are not a danger. But, when it gets excited or senses danger, it will curl up into a ball and the quills straighten out and become very prickly. It is this creatures defense mechanism. Yet, it was the animals face. Those two black eyes are filled with curiosity. They were constantly looking for the next adventure. His tiny nose was the fastest moving feature in its adorable body. You could have put music to the movements and rhythmically tracked its antics. 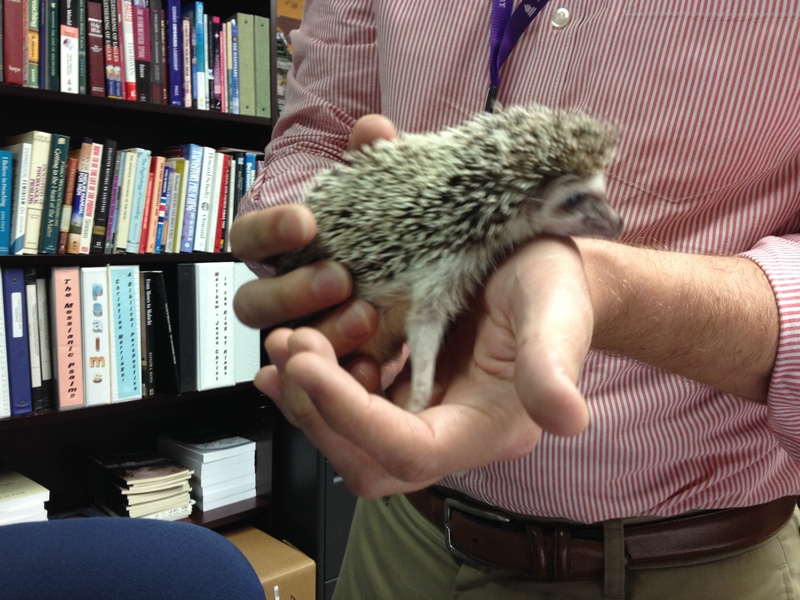 This hedgehog was a fun visitor to our campus and left a smile on many faces. The decision was obvious to me. I had several watches that were not running. The batteries had given out. Now, these keepers of time were sitting in a drawer. 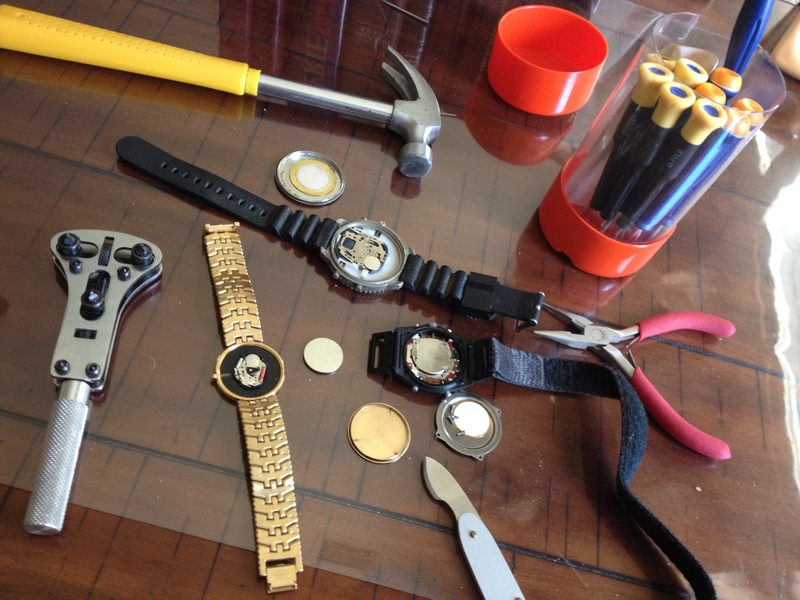 I had an epiphany, “What a waste!” That is when I dug out a few watch tools that had accumulated over the years. If I could carefully open these watches up and not lose any of those miniscule parts, then perhaps I could find replacement batteries. Should I be successful then I could have optional watches to wear. If I failed and ruined any of these time keepers, then I would not have lost anything since they were laying unused any way. That’s how a resourceful mind thinks. What can I do cheaper than buying something new? Hey, I am created in the image of God! I can do this! When the back of one of the watches came off, I was thrilled. Then, something flew out and I heard it fall into my office garbage can. My garbage can was full of papers, envelopes and discarded junk mail. It would be like find a needle in a haystack! Carefully, I turned and unpacked the garbage can, carefully shaking the papers. Then, I saw it. It was a rod, a spring-loaded rod. Can man make things so tiny as this? Sure, and it was a necessary part of putting my watch back together again. When I reached out to retrieve the part, it rolled off the paper and disappeared in the dark folds of the remaining papers. I returned to the careful search. Again, I saw the elusive part and successfully snagged it on my second attempt. Whew! I am not used to working in a world of miniatures. Four watches later I extracted all of the dead batteries. I replaced one and proudly wore my now-working time piece for the rest of the day. The other three watches have weird batteries. It is time to shop at a specialty store and get these wristwatches back on my wrist to do their duty. I stopped by two stores during my battery hunt. Neither store had the batteries that I needed. It may be time to stop by a specialty store. The thought crossed my mind that I may have to reassemble my four watches and bring them all to a watch shop and pay someone else to do what I was almost able to do on my own. Rats! Yep, I am a guy. As a guy I have an unofficial official “man-card”. With this card we males can function with impunity when it comes to certain social practices or lack thereof. There are several categories where these male operations occur. Some are audible. Yes, certain sounds are allowed and expected as natural. They might embarrass the fairer ones of God’s fine creation. Nevertheless, they are noises that the Good LORD designed in these amazing bodies of ours. Instead of engendering frowns, gasps or the consummate rolling of the eyes, a smirk, chuckle or knowing nod are perfectly appropriate. Then, of course the category of visual enhancements is a dominant part with approval by male card holders. While there is a large margin for flexibility for men when it comes to aesthetics, certain options are universal. Men love camo. Recently, I sent a camo outfit to my grandson. He is four months old but his overalls are perfect for any of his outings. Of course I sent him a bib in camo to match his outfit. Other than camo, combinations of black, grey or khaki work great as well. Bold steps in color include blue, navy and maroon. Pattern colors work as well as long as they are utilized in plaid. This is a good time to correct the misunderstanding that a man card permits or approves of poor grammar. It does not. However, it does not disapprove of it either. After some snickering is released, then there can be some effort to correct any agreements, replacement of colloquialisms or sentence structure alterations. 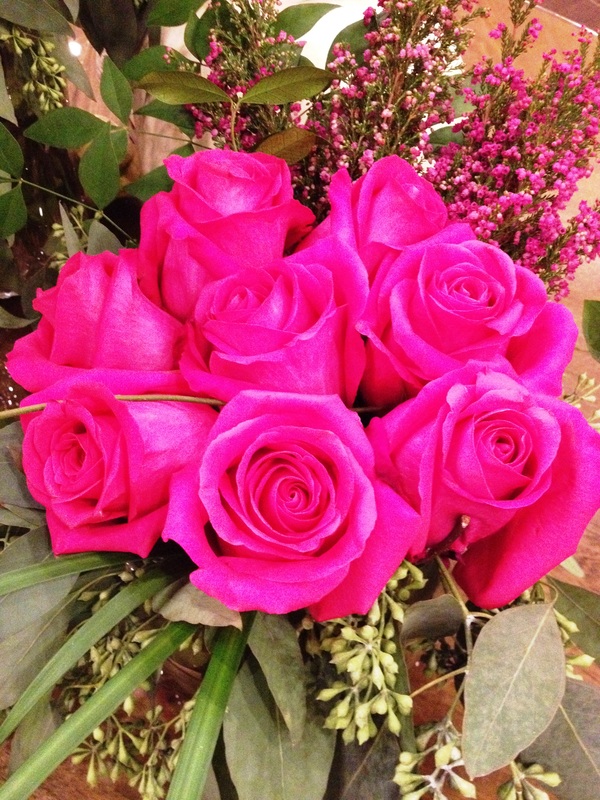 Another correction that must be recognized with the application of the man card guidance is the matter of the color pink. Pink is not the enemy. There are plenty of pink camo patterns that are just fine. Several items have pink highlights that only serve to enhance a product. For example, there are rifles that have pink highlights. Roll bars for 4×4 rigs are sometimes in pink. The list goes on.